The lion of the tribe of Judah, in the pre-eminent righthand position, wearing the Crown. The Unicorn(Bull) of Ephraim, of equal stature with the Lion. The harp of David, recognizes the Davidic Covenant and symbolizes the marriage of the two lines of Judah in Ireland. Is this some off-shoot of Anglo-Israelism? No. This shows Judah to the current British monarchs...and many other kings along the way. "British Israelism (also called Anglo-Israelism) is the belief that people of Western European descent, particularly those in Great Britain, are the direct lineal descendants of the Ten Lost Tribes of Israel. The concept often includes the belief that the British Royal Family is directly descended from the line of King David. There has never been a single head or organisational structure to the movement. However, various British Israelite organisations were set up across the British Commonwealth and in America from the 1870s, and many continue to exist. Adherents may hold a diverse set of beliefs and claims that are ancillary to the core genealogical theory, but there are central tenets that all British Israelites follow, including Two House Theology, which is at the core of British Israelism." IDK about all that. Ive read it vaguely. I know this, The current British monarch descends from two tribes- two lines of Judah and tribe of Dan which was took out of the 144,000 because the antichrist will come from Dan. 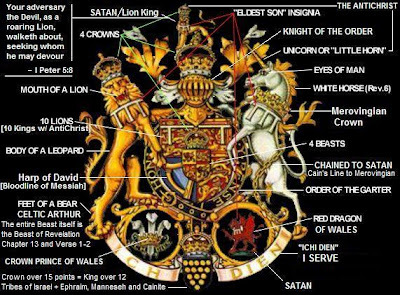 Prince Charles has all the symbology of revelations on his coat of arms and He will be King when Elizabeth dies. This isnt hard to trace. They dont deny it either. They still are crowned on Jacob's Pillar as all Judah kings have been. That's been successful refuted. I do admit that it's a fanciful little theory though. Anna we are not on the same page here. I havent said once all ten tribes are angelo-Saxson. In fact I claim angelo-saxson is a little part in it, very little. I said only two tribes are in england. Though two important ones, JUDAH AND DAN. Dan brings forth the antichrist and Judah will always rule as the Bible said David's seed will always rule, what other king on this earth is ruling...Britian is the onlt signifiant royalty in the world. Also there are many wholes in the site you posted, Im sorry. New material. You follow Biblical symbology, its there for reason. Now, I can go over all of this now if you want, but I can make it very clear in a proper formal debate. Would you accept my challenge? I dont care for debate, you post it here. Think long and hard because this is one you will run away with your tail between your legs. Haha @ Scotty. Why come on a debate site if you won't debate anything? Because I can....They do have forums here right? Im sure they do, Im posting in it. I decide what to debate. This subject is packed with information far to much to be in a limited debate. Its for suckers. Why cant you debate here. think about it you can better. Alright, I will .... prove that Prince Charles has one ounce of blood from Dan or Judah. I don't mean assert it. I don't mean imply it. I mean prove it. OK, shall I start with how England doesn't even have a lion on its shield? That's always a very easy one. Or how about everything you wrote is bare assertion? Yup. England has leopards, not lions. It says it very clearly. Lion Passant is essentially old English for leopard. "The animals which Richard I had three of on his shirt were leopards. At the time they were not aware of the difference between lions and leopards." Minute 35 onwards for the leopards. Should say it is page 84/5 in the book I provided. To quote Stephen Fry, Your argument is based "on a lamentable, terminological inexactitude, or a lie". Well you shoulf first deny that Charles is not blood of London- Don is another name for Dan, He isnt kin to the Danish- Dan, Greece, Denmark- Den. As the Bible said Dan would leave a trail as a serpent- He his the serpent. If you look thorughout Europe the name Dan runs through it. This means danites settled European nations. Chrales in fact is realted to all European nations, they marry within the same blood for that reason. When Babylon conquered Judah they took the kings and male heirs but not the female heirs. The servivng preist took the female heir to Egypt which in turn went to Scotland and married a Danite King. Then after Jesus Christ his Judah blood married into the royalty completing the full Judah bloodline and also Danite. Jesus and the antichrist will come from the same blood line except the antichrist will also have the Danite blood. This is Biblical. You post a video with no creditability and I post straight from the UK page itself. - Don is another name for Dan, He isnt kin to the Danish- Dan, Greece, Denmark- Den. Who said? My uncle's name is Don (short for Donald), and it seems to me that Dan would be short for Daniel. As the Bible said Dan would leave a trail as a serpent- He is the serpent. There is a difference between leaving a "trail AS A serpent" and being a serpant, wouldn't you say? If you look thorughout Europe the name Dan runs through it. This means danites settled European nations. I could, in fact, simply assert that the name "John" runs all though it. Doesn't matter. Chrales in fact is realted to all European nations, they marry within the same blood for that reason. When Babylon conquered Judah they took the kings and male heirs but not the female heirs. The servivng preist took the female heir to Egypt which in turn went to Scotland and married a Danite King. I said, "Don't just assert it. Prove it." What'd ya do? Asserted it. Then after Jesus Christ his Judah blood married into the royalty completing the full Judah bloodline and also Danite. Jesus and the antichrist will come from the same blood line except the antichrist will also have the Danite blood. This is Biblical. Do you think you've proved anything, other than your inherent ability to ramble? I envy your ability to condense so much bs into a few little sentences. Well you shoulf first deny that Charles is not blood of London- Don is another name for Dan, He isnt kin to the Danish- Dan, Greece, Denmark- Den. Is not "blood of London"? What does that even mean? I haven't seen London bleed, so it's obviously either a metaphor or it's a case of imagery. If the imagery means was he born in London, he was born right in its heart at Westminster. As he is going to inherit the throne of England, that makes him the blood of England in the Biblical sense anyway, so it hardly means anything. As the Bible said Dan would leave a trail as a serpent- He his the serpent. If you look thorughout Europe the name Dan runs through it. This means danites settled European nations. Chrales in fact is realted to all European nations, they marry within the same blood for that reason. 1) No King of England (or queen for that matter) was called Dan. 2) The only King Dan, Daniel, or Danny was King Daniel I of Galicia, in far East Europe. 3) All other King Dans are mythological and well regarded as not real. 4) Claiming that the Danites settled European nations is unsubstantiated. Actually justify this. Not just unsubstantiated but purposely vague, not naming anyone. and married a Danite King. Then after Jesus Christ his Judah blood married into the royalty completing the full Judah bloodline and also Danite. Completely unsubstantiated and quite strongly goes against pretty much everything. Jesus and the antichrist will come from the same blood line except the antichrist will also have the Danite blood. This is Biblical. Seeing how specific the Bible is, it will obviously make detailed note of Jesus Christ's marriage. Please give me the Biblical reference. I quote your source, "QI (Quite Interesting) is a British comedy panel game television quiz show created and co-produced by John Lloyd, hosted by Stephen Fry, and featuring permanent panellist Alan Davies. Most of the questions are extremely obscure, making it unlikely that the correct answer will be given. To compensate, points are awarded not only for right answers, but also for interesting ones, regardless of whether they are right or even relate to the original question. " OK, so as evidence I provided a video, your source, a different source, and a book, all claiming they are leopards. If you watched the video, it clearly explains how the English thought that lions were types of leopards. Your source in fact confirms that they are leopards, but the phrase changed later to lion because that was what the peasantry (like you) thought they saw, regardless of the evidence. I posted the official book of Heraldry used by undergrads to learn of British History. You posted sources used for eight year olds who want to learn a little about England. Notice the cartoonish sans serif font used in most of your sources, that's because it's the basic information made by people who don't care too much about the technicalities. Seeing as you're trying to argue that a lion proves Biblical prophecy, though, I think you need to realise that it's a leopard. In summary, your evidence is what you see, and a source used for children. My source is the official book on heraldry, your sources, my own sources, a video which clearly lays it out for you, and finally and least importantly what I see. Is he the royal blood of London? But John doesnt Dan does. In the Bible after the capture from Babylon, do you read the Bible? I thought you read the Bible just a little or no something that it says, Im wrong. I envy your stuoidity to talk and dare to debate something as the Bilical account and havent a clue whats in it. Do I have to post every Biblical passgae for you, I know Steven could be ignorant on this but I didnt expect you were. "Do I have to post every Biblical passgae for you,"
Absolutely. I already said, "Don't assert it. Don't imply it. Prove it." You have not done that - nor done anything resembling it. KJV-R (Webster) Jeremiah 42:7 And it came to pass after ten days, that the word of the LORD came unto Jeremiah.